Risi e Bisi, meaning rice and peas, is a classic Venetian dish and is an excellent way to make use of delicious, fresh peas in spring! As the name suggests, it is an incredibly simple dish, but at the same time it is incredibly tasty and comforting. This recipe from our Italian cooking holidays in Venice includes bacon, but this can be left out for a great vegetarian version. Remove the peas from their shells, but keep the shells. Melt 30g of the butter and a little olive oil in a pan and add the onion. Cook on a medium heat until the onions are soft but not changing colour. Chop the bacon and add to the onions and cook gently. In another pan, bring the stock to the boil and add the pea shells. Cook for 10 minutes and then blend until smooth. Pass the liquid through a sieve so you have a puree. When the bacon is cooked add the peas and rice to the pan. Make sure the onions, bacon, rice and peas are well coated in butter and then add a little of the pea stock/puree. Bring to the boil and then add more of the stock, stirring all the time. Continue to add the stock and stir until the rice is soft. The mixture should look like a wet risotto and should have a soupy consistency. If it is too dry add a little water (you should need a spoon to eat it). Take off the heat and add the remaining butter and the chopped parsley, season to taste and stir in the grated cheese. Spoon into bowls and buon appetito! 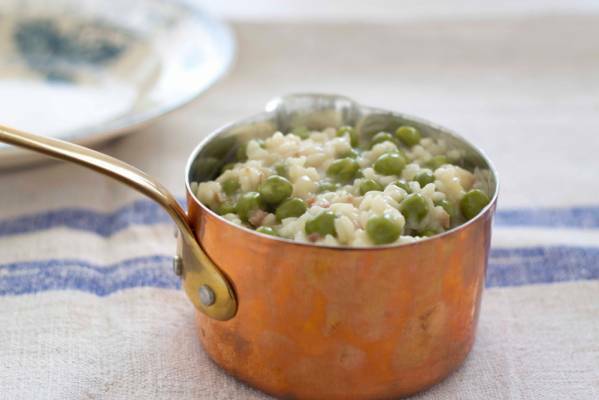 Our Italian chefs say to make an authentic Italian Risi e Bisi that for each grain of rice there should be a pea! We hope you enjoy this classic Venetian dish and for more information about our cooking holidays to Venice and other destinations download our 2015 brochure here or contact our experienced & friendly team here.